Are Valentine's Day gifts necessary? Probably not, but this blog is called Cheryl Shops, so who am I to judge? As I mentioned last year, I am not a fan of going out to dinner for Valentine's Day—it's one of my least favorite nights of the year to eat out, with maybe only New Year's Eve being worse in terms of poor service and overpriced prix fixe menus. So that's why I prefer to stay home and cook a decadent meal, like steak or spaghetti bolognese. 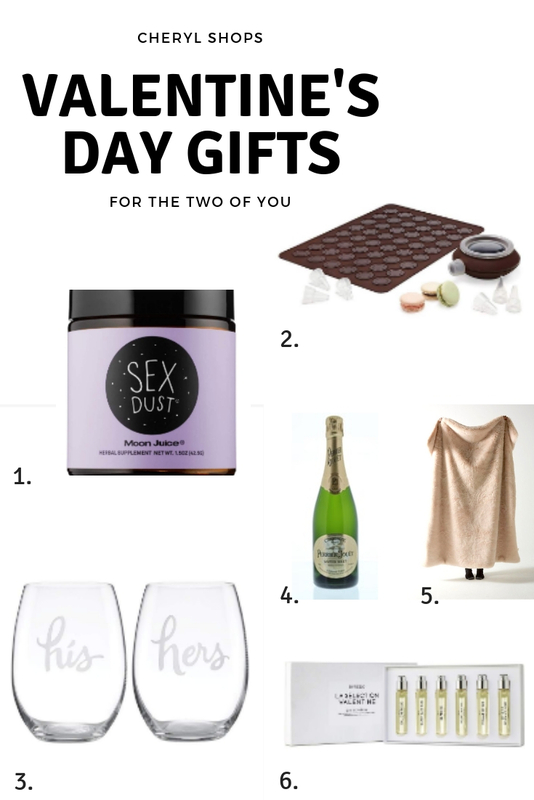 With that in mind, here are some complimentary gifts that you both can enjoy...at home. 1. Does this adaptogenic herb stuff actually work? There's only one way to find out. 2. The perfect end to a perfect homemade meal? Homemade macarons (I suggest making pistachio, which reportedly has an aphrodisiac effect). 3. Of course, no meal is complete without wine (at least in my house), so why not drink it out of matching glasses? 4. Speaking of wine, Valentine's Day is the perfect excuse to drink champagne. (Although, do you really need an excuse?) This is my favorite bargain-priced champagne, and it happens to be on sale right now. 5. After you've eaten your macarons and drank your champagne, it's time to get cozy under a supersoft faux fur blanket. 6. Last but not least, good hygiene is an important part of a romantic night at home, and this set will ensure you both smell ah-may-zing. I like the look of the home-made macaroons set Cheryl. Sounds fun. Thanks for sharing at Welcome To The Weekend Blog Hop. I hope you're having a lovely week.